We wanted to create a fantastic space that can be used both by staff as well as to host events and creative meet-ups. As we develop design-based software such as photo editing, graphic design and desktop publishing apps, we work closely with some of the best artists and illustrators in the country. This display would showcase their work in these creative meet-ups, so it was important to us that the image quality was absolutely perfect. We have done several presentations at the Apple store on Regent Street and seen LED displays in action. We thought it would be fantastic to have one here for our events and create something with the wow factor. Looking at future servicing, because the tiles that make up the LED displays are front serviceable, it means if one panel gets damaged, it can be simply swapped out without having to dismantle the entire display. It is easier and cheaper to change this single panel within an LED display than for a LFD or videowall. We worked closely with the team at Clear VC on this installation to provide additional technical support and expertise. 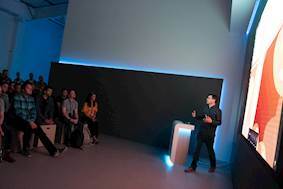 Not all AV experts have experience in complex techniques such as blending, warping and mapping and installation of LED displays. This is why we offer our ProDesign service to dealers and installers. This includes consultation and technical advice, design assistance, technical drawings, training and direct line support, on site commissioning, site surveys and projector placement drawings. We choose the Optoma display because of the long-standing relationship we have with them. They have a really good support network and we have used a lot of their products in the past – so we know they are reliable. On the rare occasions when things have gone wrong in the past, they are quick to resolve the problem – that is important to us and our reputation with our clients. The launch event couldn’t have gone any better and the success that we have had following the launch has been great. It was number one on the app store the next day and sales have been fantastic. Following the event, England’s match against Croatia in the World Cup semi-finals was streamed live on the big screen. Unfortunately football wasn’t coming home on this occasion. Challenge: Serif, developers of Affinity photo editing and graphic design software, wanted to create an impressive and immersive space to host major launch events and stream new releases around the globe. As part of a major redevelopment and refurbishment of its premises in Nottingham, this striking space would have a large display as the central focal point and would also include lighting, audio and conferencing facilities. Solution: Clear VC installed an 4 metre wide 2mm pixel pitch LED display to be the main focal point for the space. With support from Optoma’s ProDesign team, it took Clear VC just two days to mount the LED display and half a day for commissioning. 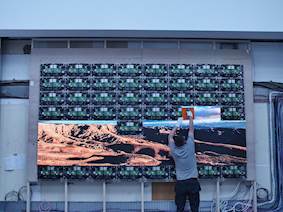 Made up from 128 LED tiles, the LED display’s ingenious mounting solution means it does not need a frame and can mounted directly onto wood or plasterboard. The visual communication specialists also installed lighting, audio setup, rack and controllers and the bespoke iPad to control it all. 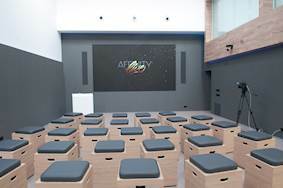 Serif, developers of Affinity photo editing and graphic design software, wanted to create an impressive and immersive space where it could host major launch events and stream new releases around the globe. As part of a major redevelopment and refurbishment of its premises in Nottingham, this striking space would have a large display as the central focal point and would also include lighting, audio and conferencing facilities. 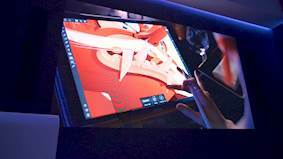 And with an eight-week window for installation and full refurbishment, it had to be completed in time for the launch of the much-anticipated Affinity Designer for iPad on 11 July 2018. The team wanted to let in as much natural light into the space as possible while still retaining a vivid, colourful image. It also wanted a single seamless image with no bezel frames slicing through the picture – so needed a large LED display as the central display. Ashley Hewson, Managing Director at Serif, said: “We wanted to create a fantastic space that can be used both by staff as well as to host events and creative meet-ups. “As we develop design-based software such as photo editing, graphic design and desktop publishing apps, we work closely with some of the best artists and illustrators in the country. This display would showcase their work in these creative meet-ups, so it was important to us that the image quality was absolutely perfect. Visual communication specialists, Clear VC, went through a design consultation process and chose Optoma’s 4m x 2.2m 1080p 2mm pixel pitch LED display (FHD20422) to be the main focal point for the space. Because the panels have an ultra thin profile of just 56mm, the display could be recessed into the wall to create a streamlined clean design which takes up less space and blends into the room. With support from Optoma’s ProDesign team, it took Clear VC just two days to mount the LED display and half a day for commissioning. 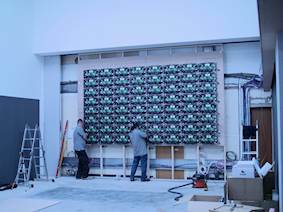 Made up from 128 LED tiles, the LED display’s ingenious mounting solution means it does not need a frame and can mounted directly onto wood or plasterboard. All Optoma LED displays come as standalone solutions with preconfigured software, fixings, scaler switchers and all cabling. The team installed the MCTRL660 LED display controller which has four outputs dividing the 1080p screen into four signal runs. Ross said: “We worked closely with the team at Clear VC on this installation to provide additional technical support and expertise. Not all AV experts have experience in complex techniques such as blending, warping and mapping and installation of LED displays. This is why we offer our ProDesign service to dealers and installers. 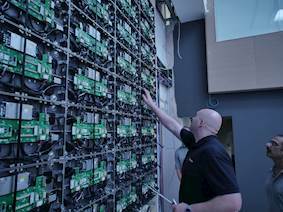 This includes consultation and technical advice, design assistance, technical drawings, training and direct line support, on site commissioning, site surveys and projector placement drawings. Adrian said: “We choose the Optoma display because of the long-standing relationship we have with them. They have a really good support network and we have used a lot of their products in the past – so we know they are reliable. On the rare occasions when things have gone wrong in the past, they are quick to resolve the problem – that is important to us and our reputation with our clients. A Crestron Digital Media Matrix Switcher allows the team to use a number of sources and outputs and send video to other displays around the building. It can send the same image shown on the LED display through to its studio which can be broadcast live around the world. A Crestron video processor allows up to four possible inputs to be displayed on the screen at one time – whether that is a live webcam feed, live news feed or a simple iPad or Mac input – all of these can be displayed simultaneously. The whole solution is controlled by a Crestron AV3 control processor. Clear VC created a bespoke iPad app interface so Serif can choose from a variety of input sources to display on the screen as well as control the lighting, electronic blinds and audio. Three iPads are configured and each can control all elements but can also all work independently. Tannoy VLS30 speakers and a Tannoy subwoofer were embedded into the wall beside the display and eight Crestron multi-directional speakers were hung from the ceiling. The microphones are reinforced through the audio to achieve a nice level audio with good sound quality. Cameras were installed at front and back giving Serif the ability to film presentations and events without needing to hire additional resources. Serif has a variety of source devices for the display including a Sky box, Playstation and Mac in the control room. 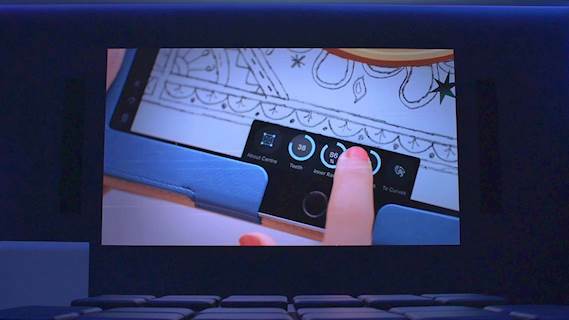 They can switch sources using the iPad controller to do a screen cast live demo. 120 people attended Serif’s launch of its Affinity Design software for iPad on 11 July including representatives from Apple, artists who were involved in the development of the app, customers and contractors who worked on the refurbishment. Ashley said: “The launch event couldn’t have gone any better and the success that we have had following the launch has been great. It was number one on the app store the next day and sales have been fantastic. The event was recorded and mixed as-live and streamed to other displays throughout the venue including screens in the bar and demo areas. This gives Serif the ability to increase attendees to its events. The recording made that evening was published on vimeo the following day to let customers, who couldn’t attend, watch the launch event. Ashley added: “We had seen the designs of the space in 3D renders but nothing can prepare you for that visual impact you get from the large bright LED display combined with the lighting. I am particularly pleased with the extra touches that were added into the project such as the Affinity logo cut out and backlit in the wall. Serif (Europe) Ltd is the developer of the Affinity suite of professional design-based software including photo editing, graphic design and desktop publishing apps for Macs, Windows and iPad. Affinity apps are built with the workflow of creative professionals in mind. They take advantage of all the latest CPU and GPU chipsets and cover the core disciplines of photo editing, vector drawing and desktop publishing, using exactly the same file format between applications. The new Affinity Designer for iPad is available now on the app store.